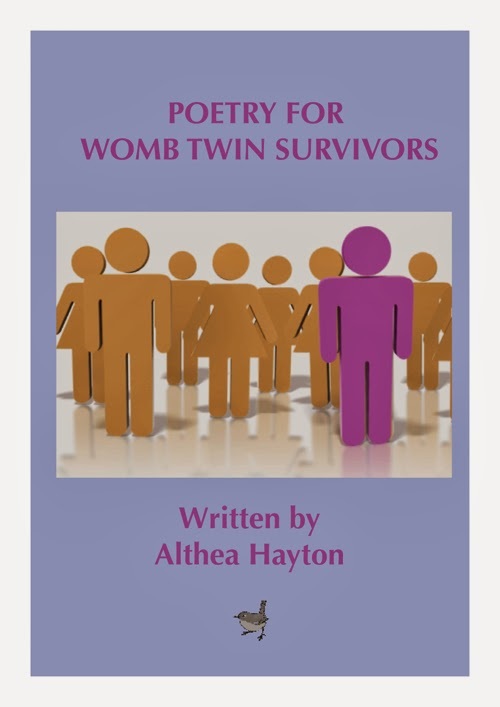 It's been one year since Womb Twin founder, Althea Hayton, passed from this realm on Aug 13 2014 leaving a rich legacy that is being realized more and more with each passing day. To honor her life and work, I have made it my personal mission to do what I can on her behalf to push forward her ideas, raise awareness, practice the healing techniques, document findings via the blogs and continue to adapt what Althea started to fast-changing times in order to ensure relevancy to the younger womb twins coming forward - for the womb twins Althea based her foundational work on were different than those coming forward now. Early days included work with older womb twin survivors who often had no proof but found tremendous healing with this discovery/modality after years of other attempts not quite solving it. Today we see younger womb twin survivors who always knew because they had proof of Vanishing Twin Syndrome or knew they were conceived as a twin/multiple through methods of IVF/ART. Future work will need to facilitate the changing needs of survivors of Multi Fetal Pregnancy Reduction. And I'm seeing new synergies among Living Twins whose pre-natal imprints cause issues and how this work can help them get to the source. I'm seeing more people who are both Living Twins and Womb Twin Survivors. The walls between camps are coming down as we realize that people can be all: a living twin can be a womb twin survivor triplet who becomes a twinless twin who then must come to terms with their individuality. Although the landscape has become ever-more complicated, the healing set forth by Althea Hayton holds up through it all. Her development of this syndrome and healing path have been the extraordinary solution for some already but, in my opinion, the real power of what it's meant to transform is yet to come. I'm proud to say the work is proving effective in every type of scenario. - Developed a new womb regression technique utilizing float pods (a sensory deprivation saltwater tank) which can be used for anyone - the masses can access their potential 1 in 8 wombtwinness, womb twins can float safely with guidance to access and resolve womb trauma, any kind of womb/birth memory can be worked with in this state of relaxed regression. - Documentary: shooting a film which will showcase Womb Twin Survivor syndrome featuring a 15 yr old Vanishing Twin Survivor who bravely speaks her truth and exposes her coping journey. After 3 therapists and psychiatric hospitals failed, just 5 months of womb twin work gave her a new level of comfort in life eliminating unwanted behaviors such as eating disorders & self harm, releasing survivor guilt and allowing her to step into her Alpha power. Several other subjects have been shot and will also be featured as smaller youtube segments (coming later this year) including: a revealing conversation with a transsexual who admits she was probably a twin as she discovers the idea for the first time and we trace her history to put the clues together and a state-of-the-union chat with twin psychologist Dr. Barbara Klein, author of Alone In The Mirror among other books, in her Beverly Hills office. - Future Podcast: developing a live podcast in conjunction with twin psychologist Dr. Barbara Klein because we believe living twins, twinless twins and womb twin survivors all have the same stuff and can all help each other. Because people can fit more than one of these categories, synergy is needed across the board. - Womb Twin seeds were planted at the Twin Days Festival in Twinsburg, OH in August. Any volunteers for next year?